What kind of prices do customers for construction jobs want? Some want the lowest bid. Others want value for money. Yet others want to reduce their financial risks. Each of these construction pricing approaches may be valid, and they lead to different commercial strategies. A desire for risk reduction may make a customer push for a guaranteed maximum price contract or GMP. In its basic form, a guaranteed maximum price or GMP says a customer will pay you, the contractor, for the costs of doing the job plus an agreed amount of profit to you—up to a predefined maximum level. You then have to absorb (“eat”) cost overruns, but cost underruns are reimbursed to the customer. It’s no wonder that customers find the idea of a GMP attractive. What does it mean for contractors? Charge the customer more. Greater risk should mean greater reward. Watch out for competitive bidding situations and being undercut, however. Pass the risk on. If you, in turn, are working with subcontractors, you might offer (or impose) GMP contracts for them. You’ll need to make sure that this does not lead to subcontractors defaulting later and jeopardizing the overall performance of your construction project. Minimize the risk. Good construction estimating software can help with accuracy and precision in costing jobs, and reduce the need to "bloat" a GMP because of unknowns (which would lower your chances of getting the contract). If the customer is to reap the benefits of any cost reductions down the line, cost accounting will need to be visible and transparent. As construction jobs get bigger, so can the expenses for the customer of reviewing costs each time you ask for payment for a completed phase of the building. One solution may be to use cloud-based construction management software that allows a customer to directly see cost details of his or her project. This, in turn, helps contain costs to the customer and can be a selling point when bidding for the job in the first place. 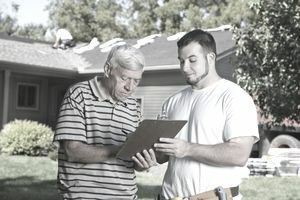 Building job specs can change after work has begun if the customer has a new need that must be satisfied. In this case, however, the impact on the GMP must be assessed and agreement from all parties obtained for any necessary changes. The "G for Guaranteed" only holds good for given initial project specifications or when correctly redefined. As a contractor, it may make sense for everyone that you also benefit from any cost savings you make. This increases the potential reward to you and invites you to look for such savings that benefit both you and your customer. Sharing the savings can be done in different ways—for instance, on a fixed percentage basis, or as different percentages applied to different levels of cost savings achieved. A non-negligible advantage of a GMP contract is that it establishes a final contract price. That can make financing easier to obtain, compared to open-ended "cost plus" agreements for which there is no upper limit. Work on a project can also begin before a design is complete or on items in the building process that cannot be fully costed at the start of the construction phase concerned. The inflexible upper limit of a GMP contract may be avoided by the use of an estimated maximum price or EMP contract. An EMP can offer not only benefit sharing in cost underruns but a shared contribution by both the customer and the contractor to fund cost overruns. You can get even close to having your construction cake, and eating it too.